One day a farmer's donkey fell into a well behind his house. The poor donkey cried horribly. The farmer tried to lift pull the donkey out, but all his efforts failed. The farmer already had plans to cover that old well. Finally, the farmer thought to himself, that the donkey was already very old and it wasn't worth enough to spend money for pulling it out. 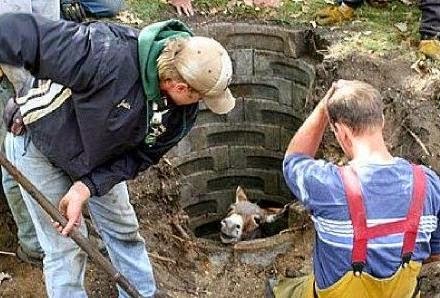 He decided to cover the donkey inside the well. The farmer called his servants and ordered them to shovel some mud into the well to burry the poor donkey. The servants did what they were ordered to do. At first, the donkey cried horribly on seeing what was happening to him. But after sometimes, an idea came up in his mind. Every time when the servants put dirt on top of him, he would shake it off and take a step up over that dirt. Soon, the donkey stepped up over the well. The farmer and the servants were amazed to see the smartness of the donkey. MORAL : We should never ever give up even when the people around us has given up on us.